Now users can text chat from computers or mobile devices! The implementation of a text chat option has been high on our priority list for several months now and we are delighted to finally announce this feature has been rolled out across all Chatki platforms. Chatki, a social video chat network which randomly matches users with each other, has added new features to their service including a text chat box. Having switched from Adobe Flash to WebRTC technology recently, Chatki has continued to improve user functionality on the video chat platform with this latest addition. The text chat option has been added after it became the most requested function in feedback received from users of the platform over the last 12 months. Adding text capabilities to the video chat platform opens up a whole new method of communication, particularly for users who have a slower internet connection or do not have access to a high-quality microphone or speaker system. 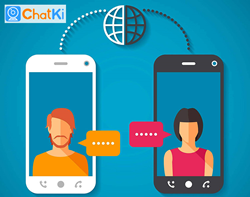 The text box also allows users to take full advantage of the multi-platform technology available on Chatki which allows the video chat to work seamlessly on computers, mobiles, and tablets. Users can now also chat in public without the need to use headphones or talk aloud to their connection. Chatki has enjoyed a very successful 12 months, rising over 200,000 places in the global website rankings according to Alexa.com and becoming one of the most popular random chat services in the world. The aim going forward for Chatki is to continue to implement innovative and exciting features, enhancing user experience and functionality. Chatki is an innovative random video chat social network which connects users randomly via webcam chat. The free and anonymous service facilitates thousands of connections every day from users around the world. Chatki is a multi-platform video chat service which works seamlessly across desktop, mobile, and tablet devices.